Over the years I have obtained some good tips in determining good balance and type in a Mini Rex- mostly these lessons came from Anne Lassen of Ye Wee Rabbitry and Joey Shultz, ARBA Judge, who always took time out to answer our questions at the show table. I thought I'd pass these tips on as it may help people who are bunny shopping and trying to improve their herds- Once Anne showed me these easy rules to follow it suddenly all made so much sense and became so much easier. I had a tendency to get animals who were long in body type. So this is a lesson in Balance of Body-- Its probably what a make-up artist or an interior designer learns in school (balance of the face and of a room) . Women's magazines teach us to apply makeup to enhance the balance of our faces- we learn to take a pencil and run it from the base of our nose outward to the brow bone to determine where the end of the eyebrow should be. I learned I wasn't taking my eyebrows out far enough over my eyes for good balance- once I learned that trick my eyes became more balanced to my face. We are going to teach you the same tricks with Judging a mini rex. So get out your rulers or pencils and look at these pictures. After you learn this (use the pencil to get you started) you WILL be able to pose a mini rex and eye ball him and know if its what you want in your herd- you can also do a good job of judging a picture of the rabbit if you don't have the actual rabbit in front of you--I use a blank card and hold it up to the picture and mark the ear length on the card and then do the same for the head- if the ear length on that card is longer than that head I don't buy the rabbit-Here's another tip from Cindy Servis- she says the TOTAL length of the head and ear should NOT exceed the animals depth or width- we tried this theory out and it seems to be true- a well balanced animal has equal parts- head and ear length=depth and width. If the animal is posed properly, and we'll talk about posing, you can Judge it very well with a picture. Domestic rabbits magazine had a picture of 3 New Zealands and asked people to Judge them from the picture and they placed them the same as they had been placed at the shows! Here is a link to further educate yourself about posing and pictures. This is a junior doe slated for show row- Pictures 1 and 2 show how I test ears to see if they are in balance with her body- they need to be shorter than her head. They are, so she passes this test. If they are even with the end of the nose or longer, I usually move them on as pets. In Picture 3 we see the pencil laid across her back horizontally - she is in a properly posed position. The highest point of her back is higher than her ears- Good, that's what we want! When posing always have all FOUR FEET flat on the ground- no tippie toes or it throws the whole thing out the window! In picture 4 we have the pencil in a vertical fashion. Place it even with the toes of the hind foot which should be directly under the hip-you want to be sure that the highest point of her back and hip are over the end of the toes of her hind foot. Good, she passes this test too! I like this doe! These two rabbits peak early or in front of pencil- see what happens to their rear ends- they fall away and slope off - Caution: Juniors learning to pose tense up and freeze their muscles and push forward- get them to relax and make sure they aren't just tense before you cull. I pick them up and let the rabbit slide out of my hands and back to the table several times to relax and loosen them up then try reposing My red doe, NIKI, looked like her hind end really sloped off when she was young and my husband wanted to cull her- but I hung on to her and 14 Legs later I like to tease him about it!! (she grew up and no longer tensed those muscles up) . These pictures show the finger test. First we test balance of width to depth - the width between the hind legs should be at least 3 fingers wide- they should not be cow hocked- if you feel those hocks hitting your fingers there could be a problem. In the second test the rabbit should have one finger width between the bone of the ribs and the bone of the hips- if you can get more fingers in between those bones, the rabbit is too long in the mid-section. In these two pictures we are testing balance of length of leg to length of stomach- which interestingly enough should be the same-- we measure the length of the hind foot from the hock to the toes. I then mark it on my pencil and then measure the length of the underside of her stomach- measure the flat part from the bone of the front leg to the hip bone or beginning of the hind leg. They are equal - good! This rabbit is in balance. I usually find that the ones that are well balanced as juniors stay that way and don't go through a lot of different, gawky growing stages. I like to wait until they are 16 weeks to show them so that junior prime coat is in and they look good. They should be done growing and in balance by 16 weeks! In these photos we have a blue junior doe that is long in body and shoulders- to demonstrate this we can easily put 2 fingers between her rib cage and hip bone- then we see a side view on her- she's not very deep and looks long-- and in the last picture we do the test on the underside- her belly length is much longer than her hind foot by a good 3/4" of inch- I have a hard time holding the pencil and doing the photographs so bear with me as to the exact placement of everything- but if you understand the premise and can do it at home we have achieved our goals! In the next set of pictures, we have a Gan doe- this line tends to throw some longish ears which come from a few of the deep, but awesome does in that line- this doe and her sister have 3 1/2 ears but look at what depth she has! I tested her ears and they are shorter than her head (her ears would never fit on that jr. castor doe-as her head is little) but her ears fit her body- see the depth- the arch of his back is higher than the ears- a Judge will look at this doe and see a nicely balanced animal- When it comes time to breed her I will use a little buck with short ears like NAM! This is an example of how not to pose a rabbit- its feet are pushed too far forward- they should be lined up under its hipbone- see what happens- the hind end looks undercut and the shoulders dip down behind the neck. Now pose that animal right and I bet he's great looking! Take an animal and pose it both ways and see the difference- take pictures and study them! Pictures are unmistakably the best way to see the difference a good and bad pose makes- they also help to see the rabbit clearly- I miss many things I always catch on the photo! Hope this helps and if anyone else knows of any good tips please e mail them to me and we'll put them on this page! Also, there 5 types of rabbits, Commerical, Full Arch, Semi Arch, Compact and Cylindrical. Mini Rex are COMPACTS Here is a description of Compact rabbits and a listing of the breeds in this group: This group is short, blocky, compact and possess the same qualities as the Commercial group, but are too small to qualify for the meat industry. 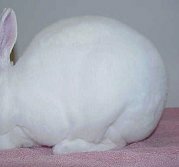 Breeds included in this group are: American Fuzzy Lop, English Angora, Standard Chinchilla, Dwarf Hotot, Dutch, Florida White, Havana, Holland Lop, Jersey Wooly, Lilac, Mini Lop, Mini Rex, Netherland Dwarf, Polish, and Silver. An in depth explanation of determining body type. A book everyone should have in their library! Also see Cindy's article Breeding to Improve in which she states, "Quality linebred animals are worth their weight in gold."